To see this post correctly you need to have a UTF devanagri font installed (eg. Sanskrit 2003). See how to do this here. 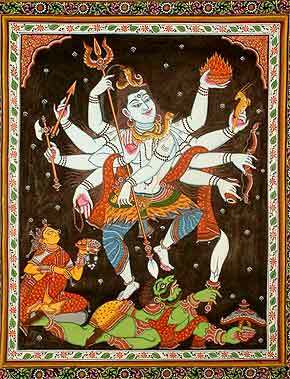 Pathanjali is stated to be the Avatar of Adisesha and is depicted with a human face and the body of a snake. Vyagrapadar has also a human face and his legs are like that of a tiger with long nails. Nandhi, the divine vahana has two horns (Kombu, in Tamil) and four feet (Kaal in Tamil). Bhringi has three legs. Pathanjali was teased by the other three saying that he has neither Horn (Kombu) nor Kaal (legs). Pathanjali gave a rejoinder stating that the other three have separate eyes and ears which was a disadvantage. If they concentrate on Ishwaras dance form by seeing, they will miss the laya or thala and if they concentrate on the laya and listen, they will miss out on the visual treat. However, Pathanjali, in his serpent form, had a common organ for perceiving sound and sight (it was commonly believed that snakes make use of the same organs for hearing and seeing) and therefore could concentrate on both the form and laya simultaneously. Pathanjali also stated that inspite of his not having Kombu and Kaal, he can appreciate the cosmic dance of Shiva better and will sing His praises. The trio of Nandi, Bhringi and Vyagrapadar teased Pathanjali further saying that he had no Kombu and Kaal and how will he sing Shivas praise without Kombu and Kaal. Pathanjali said that since he himself had no Kombu and Kaal, he will sing Shiva's praise also with a sloka in which the letters had no Kombu or Kaal (eEa etc.). The Shambu natana sthothram has no words with Kombu or Kaal. This was sung according to the laya/thala of Shiva's cosmic dance.